· Cash position remains sound with forecast activities fully financed until late 2019. At the date of this report, the price of tungsten, per mtu of APT (Ammonium Para Tungstate) was US$262.50/mtu, while the molybdenum price has sits at US$11.25/lb. Industry discussion continues to forecast tight supply conditions for tungsten concentrates and downstream products, with dominant supplier, China, enforcing improved environmental standards, and restricting the issue of new mine production licences. In addition, suggestions for molybdenum are for supply constraints for several years, and a number of potential molybdenum off-take partners have indicated a willingness to discuss fixed price purchasing agreements. 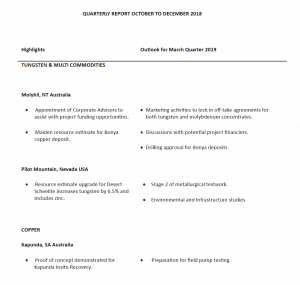 During the quarter, Thor advised the appointment of London based Argent Partners to provide corporate advice aimed at optimising outcomes from financing the Molyhil project. Various potential partners have expressed interest, and it is hoped that an acceptable arrangement can be finalised in the near term. Earlier in the year, the Company also announced details of an updated Definitive Feasibility Study (DFS) with attractive commercial outcomes. Adjacent to Molyhil, the Bonya tenements, which Thor acquired an interest in earlier in the year, host outcropping tungsten deposits, a copper resource and a vanadium deposit, which is under evaluation. Thor completed the acquisition of an interest in the Bonya licence area close to Molyhil during the September 2018 quarter. An initial drilling program is an important next step in assessing the tungsten deposits which directors believe, should add to both the life and the scale of Molyhil. Regulatory and traditional owner heritage clearance work to this end is in process, and an initial drilling program is expected to commence during the March 2019 quarter. 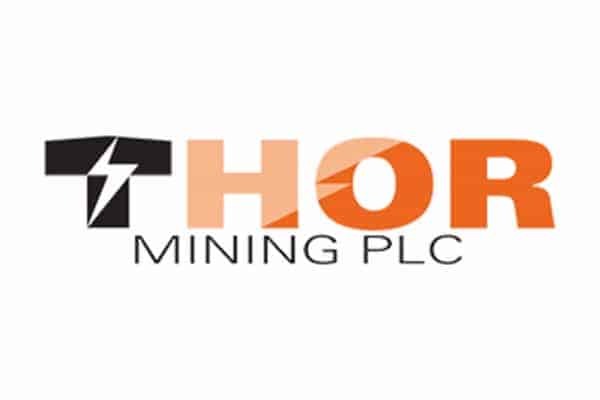 During the quarter Thor announced a maiden resource estimate for the Bonya copper deposit of 230,000 tonnes, grading 2.0% Copper (Cu), containing 4,600 tonnes of copper.